(REVIEWER?S NOTE: Phantasy Star Online Episodes I and II Plus can be played online, for a monthly fee, or played offline. Because this version of Phantasy Star was specifically designed to be more offline-accessible than it?s predecessors, I have chosen to evaluate the game primarily on its merits as an offline experience.) To this point, Nintendo has been notoriously indifferent when it comes to online gameplay, leaving it up to third parties to carry the load. To this point, only Sega has done so, producing Phantasy Star Episode I and II (PSO) and Phantasy Star Episode III: C.A.R.D. Revolution for the Nintendo GameCube. Unfortunately, two games don?t seem to justify the investment in a keyboard and broadband adapter. Perhaps in response to this, Sega has released a beefed-up and more budget-priced version of Phantasy Star Online: Episode I and II (PSO). PSO Plus differs from PSO in a few ways. Most importantly, offline users can now access certain quests from Episode II that were previously online-only. There are also some other extras and challenges, including some downloadable mini-games for the Game Boy Advance, that were previously online exclusives. In short, this game was designed to be more accessible to offline players than the original PSO. So, with more offline features, co-op and competitive multiplayer split-screen offline play, a bevy of sidequests, and, most importantly, a cheaper price tag, does this title deserve your cash? That was a question I had. And so I searched the Net, and found to my amazement that there were precious few reviews of this strange little title with the strange little name. So, taking a mild gamble, I sprang the cash for this release, and what I unearthed was a lengthy title that - while still an online game at heart - possesses passable single-player value and solid multiplayer value. PSO Plus, like PSO, begins with the story of Pioneer 2, a colony ship sent to populate the planet Ragol. Ragol is already inhabited by a colony known as Pioneer 1, but that colony is rocked by a mysterious explosion right as Pioneer 2 settles into orbit. As Pioneer 2 does not want to endanger its own colonists, the ship?s government decides to delay landing and instead appoints bands of adventurers to determine what went wrong down on the planet. Naturally, you are one of those adventurers. The essence of PSO Plus is a third-person action RPG, with lots of hacking, shooting, item collecting, item selling, item identifying, weapon upgrading, equipment upgrading, dungeon crawling, and the time-honored tradition of leveling up. You can't determine where your points are allocated during leveling, but different classes (explained below) will develop in different ways according to their specifications. The regular campaign can be played with up to four players in a split-screen fashion and online as well. The multiplayer is solidly executed and is, unsurprisingly, best suited for larger TV?s. You begin PSO Plus by creating a character. There are three broad types of characters - Hunters use melee weapons, Rangers use ranged weapons, and Forces use force powers (similar to magic) - and four subtypes within each type. The game offers reasonable variety in character types, including male, female, robotic, and human subtypes that each have their own strengths and weaknesses. The three broad types also have weapons specific to them, as becomes more apparent throughout the game. After creating a character, the game then deposits you on Pioneer 2 with the simple task of finding out what went wrong on Ragol. Including sidequests, Episode I and II are both approximately 20-25 hours each (Episode II is somewhat longer than Episode I), putting a single offline trip through whole game at a reasonably long 40-50 hours, not including multiplayer time or the hundreds of hours others have reported spending in the constantly-updated online world. Most of one's time with the game will be spent on Ragol, either hacking away through the game?s main storyline or taking on one of the many sidequests. The main quests are fairly linear and involve you plowing through a few levels of spawning foes en route to some big, bad boss at the end. You may revisit old levels at any time during the game, although most of the time you won?t have a reason to unless you?re getting hammered by the baddies in a new level. 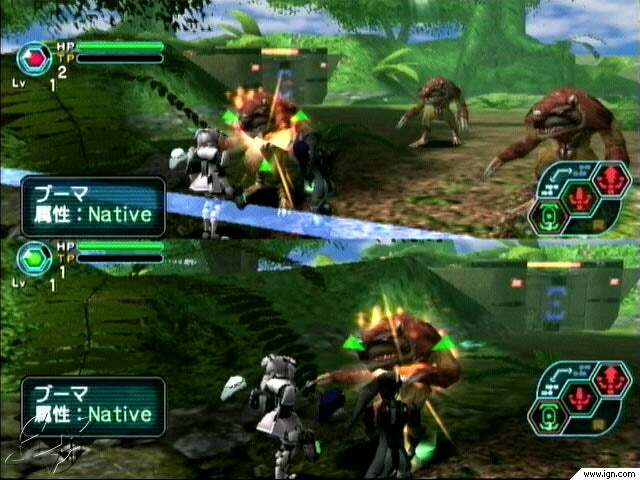 Additionally, PSO Plus offers moderate replay value to the tune of four unlockable difficulty modes for both Episode I and Episode II. Each difficulty level starts a new game from scratch, except that you retain your current level and the enemies get a lot tougher. Higher difficulty levels also unlock better weapons and special weapons. In theory one could easily spend over a hundred hours offline beating the multiple difficulty settings in both Episodes I and II, although the offline game is bound to get somewhat repetitive after awhile without the presence of others. Also, both Episode I and Episode II are balanced such that a low-level character could start at the beginning of either episode, and any created character can go back and forth between Episode I and Episode II at any time if so desired. Most likely, though, gamers will probably wind up playing through Episode I on the normal setting and then Episode II on the hard setting. In that regard, PSO Plus is fairly open-ended. All sidequests, which are strictly single-player experiences, are obtained in a place on Pioneer 2 known as the Hunter's Guild, and the quests vary from simple fetch or combat quests to somewhat more complex assignments (for example, one women asks you to take her on a fighting spree to help her lose weight for her wedding). Far from being mere diversions, sidequests are quite important in this game for a few reasons. One, your character will have trouble leveling-up enough to best each level's boss the first time through, so you?ll find the extra experience points quite welcome. Two, the sidequests offer substantial amounts of cash, which in turn can be quite useful for purchasing supplies and equipment. Three, the sidequests often contain important bits of information that help flesh out the game?s plot. In fact, if you play through the game without doing any sidequests you?re likely to have little, if any idea what?s going on down on Ragol at all. The plot isn?t PSO Plus?s strongest suit, but it?s fleshed out far better through the Guild than it often is during the regular game. Like Skies of Arcadia Legends (which was also published by Sega), PSO Plus is a port of a Dreamcast game. In some respects, PSO Plus is prettier ? the opening features a really pretty CG sequence that is Cube-quality - but it also lacks a lot of the charm and character that Skies had. Without this charm, which seemed to cover a multitude of flaws, PSO Plus feels less engaging and more flat. The character models are adequate but still dated, and the backgrounds are fair at best. The special effects, likewise, are adequate, but there?s nothing revolutionary there, either. In general, Episode II is prettier than Episode I, but it is still a Dreamcast port. On the positive side, the framerate is solid, even in split-screen mode with multiple enemies, although there are some clipping and other graphical issues at times. The soundtrack is primarily a sort of pop-techno futuristic music with a few orchestral pieces and a couple of Japanese pop tunes (J-Pop) thrown in for good measure; most of it is decent, if unmemorable. Like many online-style games, there are no voiceovers, just text boxes. The sound effects are adequate, and often offer aural clues as to what is about to happen, whether it be the appearance of an enemy or a turning point in a quest. Overall, the aural quality of PSO Plus is an adequate effort. The controls aren?t bad, but they do take a little getting used to. First off, you can?t pause the game, so you have to switch your equipment on the fly. The game does offer some customizeable button mapping as well as a pop-up menu (L+X) that can be used to switch equipment, but you?d better have your act together before combat, because swapping weapons can be a dangerous chore when you?re under fire. The game does feature a basic combo system, although it doesn't allow for button mashing. Instead, you need to be able to hit your buttons in a slightly separated rhythm to do a combo, and it takes a little getting used to. What's nice about the combo system, though, is that you are able to string weak and strong attacks together in different ways. It's not the deepest combat system ever developed, but it is still pretty nice and offers good flexibility, particularly if your weak attacks are missing the mark or you are looking for that extra heavy attack to finish off an enemy. The game uses an auto-targeting system that has its virtues and vices. The game will generally target the nearest foe in your character?s line of site, and there are times when you will be able to mow down several foes in rapid succession without skipping a beat. There are other times, though, when you will have to jockey yourself into the right angle to make contact, and this can be a source of frustration, especially when you can see the enemy on the screen and it seems like you?re facing them, but you?re not. Other times, the auto-targeting will target some box in the far corner of the room, and you?ll have to retreat or reposition yourself to target an enemy. In time, a player will become more familiar with the nuances of the auto-targeting system, but it would have been much nicer if PSO Plus has employed a more Zelda-style approach. PSO Plus is rated T for blood and violence. Most of the violence is of the ?fantasy? variety, with the only ?blood? being the puddles of goo the monster hordes leave behind. There is no profanity in the game, and virtually no sexual content save a couple of low-cut (and low-resolution) female outfits; meanwhile, most of the actual playable characters are pretty conservatively dressed. There is a ?force? system in the game as well that acts somewhat like magic but is accessed through data discs, making it more science-fiction than fantasy. As a whole, the game is pretty clean and there is little to worry about from a Christian perspective. PSO Plus is a pretty good game, but it also a game that has a fairly specific niche audience. Action fans are liable to find the combat too clunky, while RPG fans will be a little slow to warm up to a game that can?t quite decide if it?s an online or offline title. It?s clear that, even with the added content, it?s still better as an online title. For offline gamers, it would be an easy candidate for a rental, except that you?re almost certainly not going to be able to find it unless you go through an online service like GameFly. But that doesn?t mean it doesn't have virtues. I was one of those who were slow to warm up to PSO Plus. It wasn't until I got to play a little split-screen multiplayer, and then go back and do some of the sidequests, that I really started to appreciate this title. I paid $30 for this title and got nearly 50 hours of gameplay in return? gameplay that got better as I got into the game. In that context, PSO Plus is worth looking at if you like action RPG?s and you?re willing to spend some time with the title? particularly if you have some friends to play with you.